Arnold Newman, Martha Graham, dancer, choreographer and teacher, New York, 1961, 45 1/2 x 53 1/2 in. Gelatin silver print © 1961. Arnold Newman/Getty Images. One of my favorite photography exhibits in San Francisco last year was the Contemporary Jewish Museum’s “Arnold Newman: Masterclass.” While some of the artist’s portraits have achieved iconic status (think of the composer Igor Stravinsky. The image you have in your head is probably Newman’s), the CJM compiled over 200 photographs, including some shown publicly for the first time and lesser known works such as still lifes and architectural and geometric studies. Newman was renowned as the pioneer of “environmental portraiture,” though he resented the term, which describes a sort of “in situ” portrait made in the subject’s natural or vocational habitat. But the fruits of those geometric studies, as well as the motifs and errata of his subject’s work, is evident in the portraits. Even disregarding who the subjects are, the images are striking: Newman’s compositions are inventive and witty, he was not afraid to dwarf his subjects in darkness or set them against contrasting patterns or use lines and shapes to force the eye this way or that within the frame. Beyond the visual trickery, yes, a bit of (what one might presume to be) his sitters’ personalities come through in each depiction, and there is a lot of challenging straight-on glaring as well as ponderous staring off-frame in this collection, a lot of sly half-smiles and mysteriously furrowed brows. I don’t think these alone would tell as much about the subjects’ personae were it not for the astute observations Newman makes about both the nature of each of their professions as well as their specific “voices” within them. How perfect to portray a sculptor, as he does Louise Nevelson, with an extra pair of hands, and to do so using collage, one way in which the two dimensional medium can subtly suggest the third dimension. A rough-edged narrow scrap of a photograph overlays the second, looking like, well, one of the rough edged narrow scraps of wood Nevelson so frequently used in her sculptures and which appear in the base photograph. 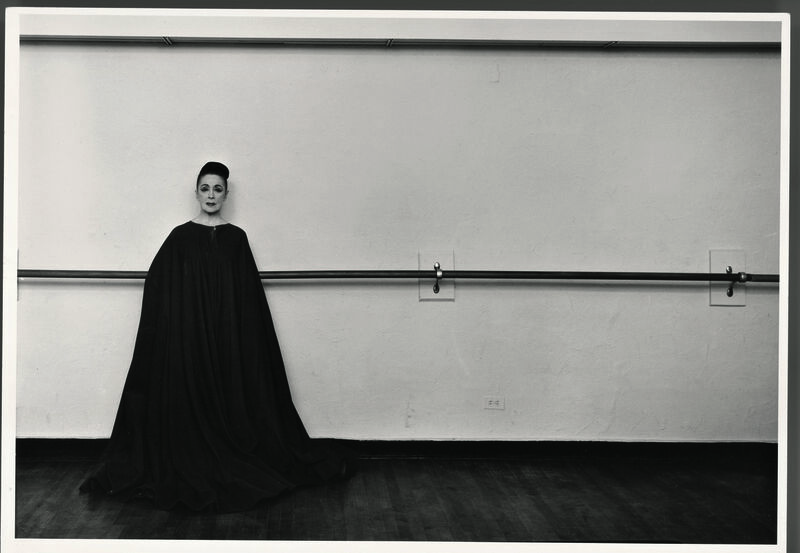 Dance giant Martha Graham stands in an oversized robe that hides her instrument, her body. It seems a counterintuitive choice for a dancer, until one realizes that it in fact emphasizes how little she need do to exude her brand of monolithic gravitas, such is her formidable physical presence. Part priestess, part workman, she stands off center in the frame, dominated by the barre, the permanent workstation of the student, professional, teacher, legend, and visionary. While most of Newman’s portraits indicate a sophisticated understanding of his subjects’ work, he usually refrains from commenting on it–although it seems he sometimes cannot help himself. Pace Gallery founder Arnold Glimcher slouches louchely against a bare wall, sloppy shirt collar, fingers jammed into tight trouser pockets, sanpaku gaze. He looks like he might as soon sell you a tab of bad LSD as a piece of blue chip art. Couturier Christian Dior sits in the foreground of his portrait, holding what looks like a riding crop in his hand. In the background are his models, posing like thoroughbreds. Making rare use of color film, Newman lights and positions industrialist Alfried Krupp for maximum sinister effect, placing him front and center and flanked by columns as pockmarked and rough as the man’s cheeks. He employs the factory’s flourescent lighting to obscure Krupp’s eyes, and casts the whole scene in an unhealthy bilious green. The portrait is such an indictment of the person and system in which he thrives that it is surprising Krupp didn’t sue for defamation. It is not, however, surprising to learn that Krupp was himself tried for war crimes, including the use of slave labor. Arnold Newman, Marilyn Monroe, actress and singer, Beverly Hills, California, 1962. Gelatin silver print © 1962, 14 ¾ x 16 ¾ in. Arnold Newman/Getty Images. 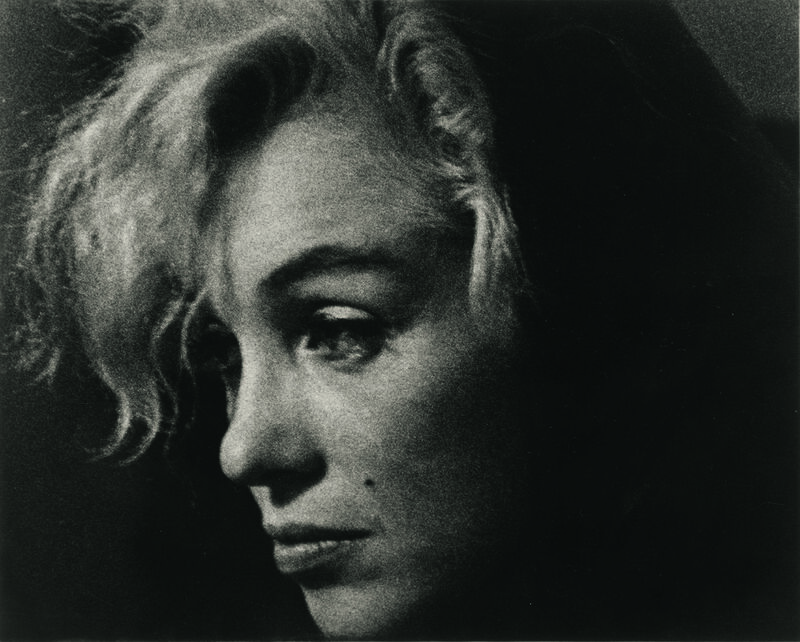 The only portrait that doesn’t somehow reflect the subject’s professional persona is that of Marilyn Monroe, actually a small part of a photograph Newman cropped around after failing to get the star to sit for him, and instead resorting to photographing her at a houseparty with poet Carl Sandburg. The image conveys nothing of the erotically-charged glamour the actress was famous for; instead it hones in on the softening counterpoint to that glamour, her vulnerability. This quality is hinted at in her on-screen performances and was drawn from a well of pain and fear begat by her fraught and sometimes abusive relationships with the men in her life. But that quality has come to dominate her posthumous persona, launched by her presumed suicide. Newman saw and captured it first; in his photograph of her taken in the year of her death, it is the glamour that is only hinted at, in the sheen of frosted eyeshadow on her lids, which droop as if she is drunk or stoned, or simply exhausted. Arnold Newman: Masterclass is at the Contemporary Jewish museum until February 1. An informative and beautiful catalogue is available in the CJM’s store. This entry was posted in ART, damn good, photography, REVIEWS, San Francisco and tagged American Artists, Arnold Newman, ART, Contemporary Jewish Museum, museums, photography, San Francisco. Bookmark the permalink.